This dragon will feed itself until it can't move, better not get too close! Name That Dragon! Yesterday's winning dragon name was, appropriately "Corpsebreath," named by Sierra. What a cold and smelly name. And the day before that (remember, the judges fell asleep) was Sarah C's "Cyana, Duchess of Death." Great names! Way to go Sierra and Sarah C! He Who Eats Until Stuffed Round Like a Bowling Ball. When Glore was little he was called Glory, for he was a beautiful glorious little dragon that made all of the other dragons so very happy. 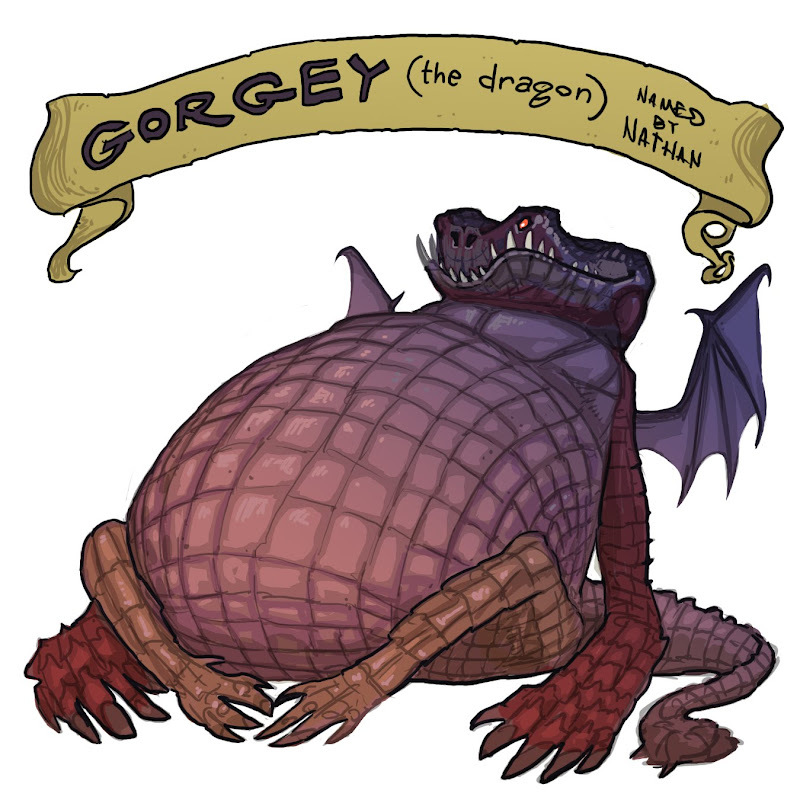 However, due to all of the attention and all of the food gifts that he received, little Glory soon became a very fat and spoiled and not-so-little dragon. Now he lives in the lower levels of his mom's cave and has a vast collection of armor and weapons. Of course he has eaten all of the warriors that were inside of those various bits of armor. Glore's mother really loves him and cant see him for the revolting slob that he is. She will always see him as her "Little Glory"; and while no other dragon cares to go near him (much less bring him food gifts), Glore's mother never fails to bring him an abundance of goodies. Roundout was teased because he was the weakest (and roundest,) but he grew up to become the CEO of the nonprofit company "Fat: The New Muscle" and was often called the "fat-is-muscle guy." His official name has been changed to Roundout: Fat is the New Muscle" on his birth certificate. or gulumph the gluttonous worm-toad. when not stuffed to the point of immobility, gulumph/gurnottin/dagriet/fudwocket lives in a swamplike habitat, acting similar to a crocidile. he used to be a good little dragon, never eating between meals and washing behind his ears, but one day he passed by the blackened stump, which had been cursed. the darkness soon took over his body and caused him to fall into a deep depression, eating to fill the hole in his heart. plus his favorite food is baloons. big ones. The Roundling, or The Plumpling. Escargot was named by his mother, a member of Frenchdragon nobility. She named him after her favorite food, Escargot, or buttered snails. Escargot grew up to become the high chef of a five-star restaurant. He moved his restaurant to Candy Mountain after he was secretly advised to do so by a gruff old unicorn named Charlie. As he grew older and rather portly (he developed a habit of eating one meal a day-- one continuous meal. ), he developed a portable stove and oven he could carry about on his belly. When not working, he carries a coffee cup on his belly and reads Dilbert comic strips, or else, of course, he eats.